I've been drawing these things for years. I've rarely discussed them publicly for a couple reasons, but busted one out for my Understanding the Pool seminar, and got to thinking about them again. That led to a little discussion, during which we diagrammed Trollbabe and Gregor Hutton's 3:16, and lots to follow up on from there. Please forgive the Very Big Jason and the Itsy Bitsy Me screens; I'm still hashin' out interfaces for these things. I'll follow up in the comments on some of the stuff we mentioned, including diagrams for the general point about (a lot of) D&D, Mars Colony, Nine Worlds, and carry. This shows the final version that emerged verbally. I included the single GM contribution to play, which is managing the Threat tokens during a mission - Jason and I discussed this as a throttle mechanism regarding the units/degree of danger. In this game, aside from providing as much colorful description and characterization as he or she wants, the GM really doesn't do anything else. I stress again, as I mentioned in the video, that the two development tracks (promotion, complexity/disillusion) are not exclusive. A given character can max out on both, max on one and be minimal on the other, or (conceivably but unlikely) be minimal for both. If they were exclusive, the system would be more competitive, baking in player conflict of interest over the in-game abstractions of "death" as a loss feature and "rank" as an advantage. That might be a fun game but it is not this game, which instead yields organic, contingent, and complicated conflicts for the characters based on (i) very local and immediate outcomes and (ii) the prevailing militarism. Another observation about the video, directly to you Jason, which wasn't as clear to me in the thick of the conversation, is how much you had focused initially on combat options in your preliminary scan of the system. Although you'd picked up on all the anti-war content that we talked about and considered it as obvious as I did, systemically, you "saw" a genuine focus on now we fight bugs tactically. 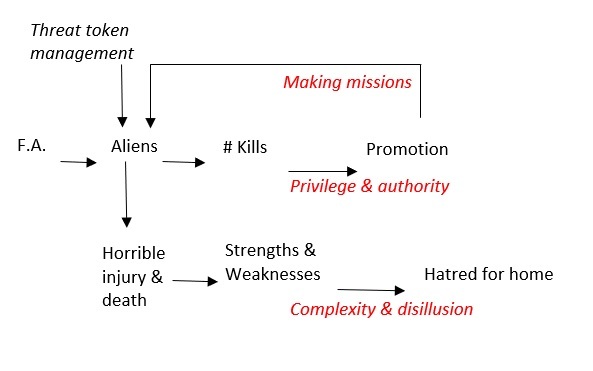 In the context of the diagram, those rules are present as an arena of tension between survival and promotion, not as a problem to be solved as a challenge "of the game." I suspect that here's where the disconnect I kept talking about occurred, historically. You say, "how do we play," and the person answers with all this talk about weapon range and movement options, and there you go. Diggin' the title card. Looks good. Thanks! My hope is that the videos’ roughness is offset by their evident improvement as I go along, with any luck, rapid improvement. The next thing is to get the hell out of the attic! I have ideal filming space downtown, but it’s hard to use it in the evenings when I’m interacting across time zones. I would be interested in the RuneQuest diagram, too! 3) the hand on the button of a weapon able to destroy the entire solar system. Why most people didn't get that math and they though of the game as shoot-them-up? This too is very simple: in this rpg culture, NOBODY read the manuals. Ever. The players read only their character sheets and maybe the weapon charts, the GM reads only the parts he thinks he need for the next session, and skip the fiction and the advices. I doubt very much that most of the players had read or noticed that "hatred for home" bit. Thanks for spotting that! I think I accidentally deleted them when editing the image format. [3: 16] Way Too Easy Or Just Got the Rules Wrong? Right now I'm a little hesitant to link these, because I've had this conversation with you before and I don't want to go the usual route. This isn't a discussion about texts as explanations and training. I don't want to talk about whether the game text does a good job. I know I brought up the issue of "why do people encounter this confusion" in the video - but not as a problem to solve, only as a reason to focus on the diagrams. Let's talk about how the diagram works, with the fact that people didn't do it as the relevant point, not why they didn't. I think I’m agreeing here by saying I always thought of “Hatred for Home” as a phase of play rather than a particular outcome or sequence of events. And in my mind I don’t know what we’ll do as a group when prompted by that option. We’ll find out when we get there as a group with our characters developed in play and the GM’s universe view sharpened by what’s happened in play. Though maybe that it is visible on every character sheet as a future state led to people short-circuiting in their mind what that meant or how it would turn out before they got there. From the accounts at the linked threads, and from similar accounts described to me in person, I think the problem or trend or whatever we call it is the opposite of that. It's too close to the immediate now rather than too focused on the far end. By immediate now (a phrase that would ordinarily be a positive thing coming from me), I mean "look, weapon types, types of armor, wound levels, range-move-attack tactics, so this is what we do." The kind of play when you fist-pump when the orbital nuke strike sequence is activated. Particularly in convention play, or in a certain kind of over-mannered "now we are checking this game out" play, this hyper-attention and specificity is the default. Moreno's also right in pointing out that we're not talking about multiple readings of the text, but rather single semi-readings filtered out into a group perception dynamic. I'd add to that my current favorite topic of distinguishing between texts as explanations vs. texts as pedagogy. The net effect is for those combat-immediate details to enter the mental "how does this game work, what do we do" space and to expand there, filling it all in, and categorizing anything else that may get said (whether clearly and well-timed or not, more than likely not) as fluff. I'd love to see the text from Tim Koppang on toys; but I can't seem to find it on the web. Anyone got a link? Please? I was able to find a couple threads where I mention “toy” or “wind-up toy” design. The first I could find is from 2009 back when I was finalizing the Mars Colony design. It’s an actual play thread from the Forge. Here’s an archived copy I kept, but I’m sure I could find the indie-rpg link if I tried. The second, and more substantial, is from the Story Games forum. Jason is quoting me from somewhere else. In part, it was from another thread on Story Games, but I also think I was talking about the concept somewhere on G+ (but I’ll be damned if I can find anything there because the place is a like a blackhole for comments). More than the “wind-up toy” terminology, which was me being provocative, the key is creative expectations. To quote myself from the above thread (always fun): "How much does a particular game design expect of me creatively?” vs. how much does the game provide ready-made? It’s an important question for me, especially so when designing two-player games. The games are cultural touchpoints. Shared experiences within the storygaming culture, not bounded by time or circumstance. That's the attraction. [...] Look ... for games that use component design and content to enable disparate groups to tap the energy of shared cultural experiences. The idea that games should allow different groups across time to experience nearly the same sort of events in-game is assuredly relevant to what I was trying to describe. I don't personally believe in a design philosophy that would allow for such things. My preferences run towards game that (1) allow the game to fail because of "bad play" by the participants, and (2) require participants to bring proactive creative input to table in order to make the game successful -- and maybe even move forward. Thanks a lot! I just realized what "wind up" means. I needed to understand whether thie was in any way related to the "toy vs game" debates, and it seems pretty clear it doesn't. I mean, this doesn't seem related to goals at all. But I guess I'll know better after I've finished reading. Thanks again! Hi Tim! My memory of the topic came from our drive to GenCon 2009 when we were stuck in Chicago traffic, in high summer, and had nothing better to do than exchange current unmoderated rants about Gamers These Days. Santiago, my understanding is that this has little if anything to do with the more general or goals-focused toys/games distinction. Thanks again for the talk, Ron! I had been wanting to connect all the disparate parts and subsystems, but I have found it so useful to just concentrate on the "moving parts" as we were calling them. I've made diagrams part of my end-stage note-taking for the games I'm reading now. So far I have made diagrams for Bubblegumshoe, Apocalypse World, and The Watch (which I just finished reading). None of mine look as streamlined as your 3:16 diagram, but each one I have done has gotten a little more focused, cutting, I hope, to the heart of the matter. What I'm interested to do next is diagram a game from the text of a game I haven't played, and then play several games and see how the diagram matches up to the played experience. Have you had to revise or reconsider a diagram after playing? And while I'm here, let me say the new site looks fantastic! 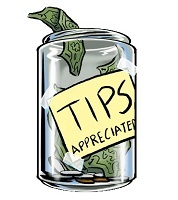 I'd be really interested to see what you've come up with for Apocalypse World. I think our mention of it was in a section I snipped out 'cause it wandered a lot and I wanted this presentation to be one clear argument. 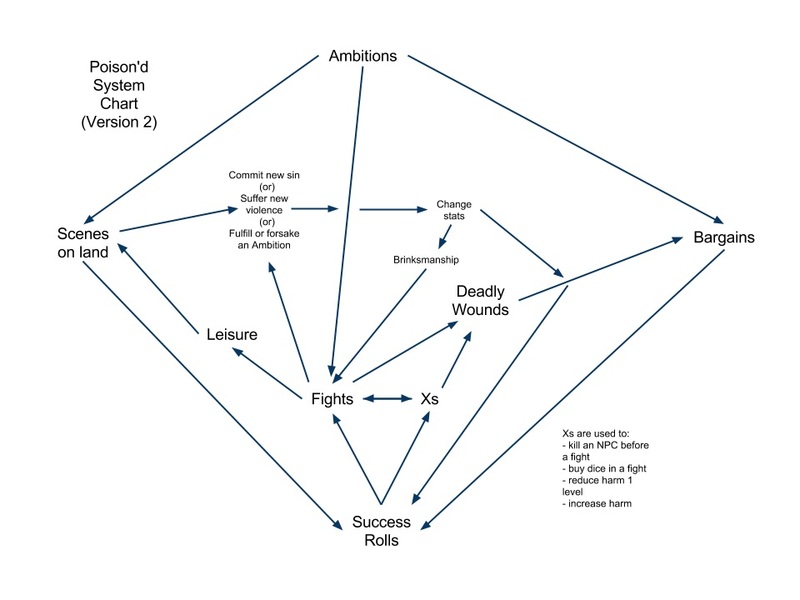 But a piece I regretted losing concerned comparing diagrams across "Powered by" games; in my case, games I've played like World Wide Wrestling, but as I understand them without playing yet, Diaspora, Monsterhearts, and The Bloody-Handed Names of Bronze. in Trollbabe, the conflict type isn't depicted, as we discussed in the video, and the precise sequence of re-rolls relative to versions of failure isn't either. in 3:16, similarly, the choices about distancing and weapon type aren't in the diagram. Experientially, each of these is one of the most important parts of the game, but the diagrams aren't intended to teach how to play at that what-do-I-roll level. They are a means for understanding the game through a particular lens, a very important lens which is often overlooked in the thick of "who narrates? OMG!" or choices about how much damage to do vs. how much weight to carry. All of this clarifies, and as I see it has clarified for a long time, the tiresome yipyap about what I've referred to as reward cycles and play cycles. These things are right here in the diagrams, at their various scales in terms of both fictional time and real time, with the relevant differences among games readily apparent, and they're not handwaving.